When a debate between candidates for Wilson's sheriff proved too popular by far for the scheduled venue, Greenlight stepped in to televise it. Jon Jimison, Wilson Times editor, said his phone has been ringing off the hook since the debate at Fike High School was announced. Fike holds a little more than 900 people. With the tickets snapped up on the first day of availability, televising the debate was what Jimison wanted. "We're very happy the city and Greenlight are partnering with us on this event," Jimison said. "By having the debate aired on Greenlight it exponentially increases access to the debate so more residents can see it for themselves." 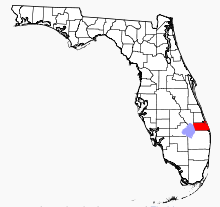 Greenlight is the community fiber network built by Wilson's public power company and is owned by the City. Wilson is fortunate to have a publicly owned network able to step in and televise the network. In many towns, the incumbent is a private company that has little interest in helping out in such a situation. Thousands of towns do not even have a local cable presence they can call on if they were in this situation -- big carriers continuously consolidate and shut down local service centers to save money. I recently visited Sibley County, Minnesota, where they are considering a publicly owned fiber-to-the-farm network. The programming they see on their TV comes from another state - Iowa! This is yet another reason communities should have networks that are directly accountable to them. Wilson's Greenlight community fiber network is ahead of schedule. They continue to operate ahead of the business plan, despite a few difficulties that offer lessons to up and coming community networks. We recently covered the fallout from their application to the broadband stimulus program where they had to disclose network information to their competitors. Fortunately, that was not the only news last month from North Carolina's first all-fiber citywide network. They also surpassed 5000 subscribers and remain 6-9 months ahead of their business plan in take rate, according to the Wilson Times. The number of customers is expected to reach 5,300 by the end of the fiscal year if the current trend continues, according to Dathan Shows, assistant city manager for Broadband and Technical Services. The city's current business plan calls for Greenlight to reach 5,000 customers by the end of the third full year of operation, which will be June 2011. This is not the first time the network has exceeded projections; the network was built faster than expected and quickly jumped out ahead of take rate expectations. One of the reasons Greenlight may be growing is its attention to local needs, as illustrated by the network finding a way to televise local football matches that otherwise would not have been available. However, the Wilson Times story goes into much greater detail regarding the competition from Time Warner Cable. As we regularly see, Time Warner Cable is engaging in what appears to be predatory pricing to retain customers and starve Greenlight of new subscribers. A lesson to other community networks, Wilson is documenting the deals TWC uses to keep subscribers. All communities should keep these records. I recently heard that the only place one finds a free lunch is in a mouse trap. As we sift through the lessons from the broadband stimulus programs, we have learned that the federal government preferred funding private projects rather than those that are structurally accountable to the community. Before the first round of stimulus applications were due, many communities recognized the costs of applying were too high for them. Now, some are recognizing the high costs of complying with the many federal rules that come with accepting federal grants and loans (as detailed by Craig Settles). And now, North Carolina's city of Wilson has found that applying for the broadband stimulus may have disadvantaged its FTTH network. Though the application was not accepted, the city has had to turn over its full application (chock full with proprietary information) to its competitors. This is yet another example of ways in which the "playing field" is tilted against the public. The Wilson Times explained the situation and settlement. The application included a proposed expansion of the network to provide reduced-cost or no-cost broadband lines to homes of Wilson County school children, a health network, increased lines for police and other improvements that would enhance the network in the city, Goings said. When the North Carolina Telecommunications Association (with prominent member Time Warner Cable - incumbent cable provider competing with Wilson's Greenlight) asked to see the full application, the City refused to turn it over -- even after a court ruled against the City. The City argued the application contained key information regarding the policy and utilities that should not be made public for security reasons. When the Department of Homeland Security ignored the City's requests to intervene, the City was compelled to release the documents. Kudos to Wilson's Greenlight fiber network in North Carolina. They are featuring some interviews with people who like their services, two of which are embedded below. What do you do when the media gets key facts about your community network wrong? Set the record straight! This blog post from the Public Affairs Manager in the city of Wilson, North Carolina, demonstrates a good response to errors in an article. In the first case, it offers "clarifications," a better term than errors when dealing with reporters, especially as many reporters have less expertise than we would like in the complicated world of broadband networks, policy, and technology. This is a good excerpt - with the City's response in blue text. Other conflicts can arise as well. For example, in 2007, when Wilson was developing its Greenlight service, the town tripled its rate for using municipal utility poles from $5 to $15 a year. That raised the pole fee for Time Warner Cable from $82,000 to $246,000 a year, but Time Warner is still paying the old rate while it negotiates with town officials over the issue. Before 2007, Wilson’s pole fee had stayed the same since 1975. The attachment fee increase was not related to Greenlight. The old fee schedule was outdated. By comparison, the cable company’s standard rates have doubled since 1997. “When the regulator becomes your competitor, it’s not a good situation,” said Marcus Trathen, a lawyer for the cable lobby. Wilson and other cities regulate only the pole attachments. The cable and telecom companies are regulated by the State of NC. The local regulation of cable services ended in 2007 after intense lobbying from the cable/telecom companies. The main issue is to make sure false claims are corrected at every opportunity. These networks and local policies around pole attachments are greek to most people. Any false claim without a response (and some that are responded to) will be believed by many in the community. Catharine Rice gave a terrific presentation detailing the ways Time Warner has responded to the municipally-owned Greenlight fiber-to-the-home network: raising the rates on everyone around them and cutting great deals to Wilson residents. I saw the presentation on the Save NC Broadband blog which also has a link to her slides - make sure you follow along with the slides. She details how Time Warner has raised rates in towns around Wilson while lowering their prices and offering better broadband speeds in Wilson. Once again, we see that a community building their own network has a variety of benefits: a superior modern network that is community owned, lower prices on the last-generation network from the incumbent, and some investment from the incumbent. Now the question is whether Wilson's residents will be smart enough to support the publicly owned network in the face of Time Warner's low low prices - a recognizing that a few short years of low prices (for low quality) are not worth abandoning the publicly owned network and the benefits it has created in the community. Cable pricing in the Raleigh-Durham-Cary NC Market from City of Wilson, NC on Vimeo. Fiona's Morgan's 2008 article on Greenlight in Wilson, North Carolina. The article comprehensively covers why Wilson chose to do it and the issues involved with a community choosing to build its own network. The Buchans have better Internet access than you do, wherever you live in the Triangle, thanks to the $28 million fiber-to-the-home network the city of Wilson is installing to every address in its city limits. That network powers Greenlight, Wilson's fiber-optic-based Internet, television and phone service. Like its water, sewer and electricity, the city now provides high-speed Internet as another public utility. Yet there's one major difference: speed. Greenlight's Internet starts at 10 Megabits per second and goes up to 100, a speed common in nations such as Japan and South Korea, yet rare in the United States. Time Warner's residential Road Runner service offers no higher than 10 Mbps in much of the state. In Wilson, however, the company recently upped its top-tier speed to 15 Mbps "because of the competitive environment," a Time Warner spokesperson said. 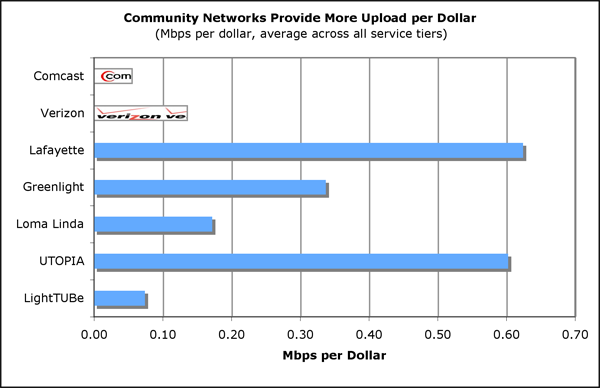 Community broadband networks offer some the highest capacity connections at the lowest costs. 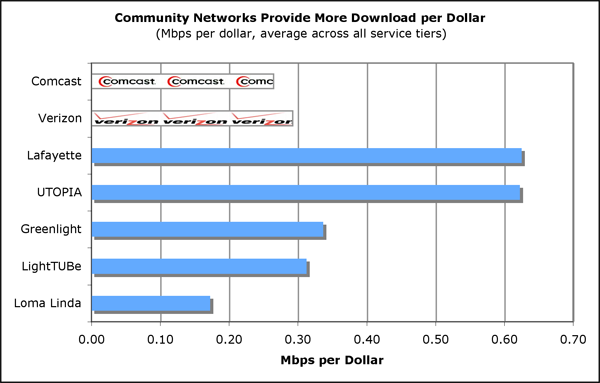 Many of these communities, before building their networks, were dependent on 1.5 Mbps connections that cost hundreds of dollars, or less reliable DSL and cable networks. The community broadband networks below are full FTTH networks, so the advertised speeds are the experienced speeds -- unlike typical cable advertised speeds, which users pay for but rarely experience due to congestion on the shared connection. In comparing some of the fastest publicly owned broadband networks to some of the fastest national private sector networks, we found that the publicly owned networks offer more value per dollar. Update: A few weeks after this was published, Verizon upped its speeds and prices for several of the tiers. The data we used is below. We thought about comparing also Qwest's "Fiber-Optic Fast" speeds, but their fastest upload speeds are below 1 Mbps, which makes them too pokey for the above networks. Note: Speeds are expressed as Mbps Down/Up. Each network has distinct offering for each tier. Lafayette Louisiana 10/10 $28.95 30/30 $44.95 50/50 $57.95 - - All connections come with 100Mbps connections to others on the local network.